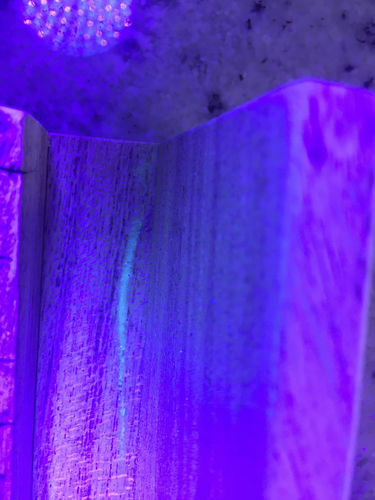 An interesting feature of hide glue is that it fluoresces under UV light. Most glues fluoresce to a certain degree, but hide glue really stands out. It’s a great thing to have in your bag of tricks when you’re cleaning off glue from joints, etc. Hide glue washes clean in warm water very easily. Unlike synthetic glues, you can even clean it off long after it’s hardened. 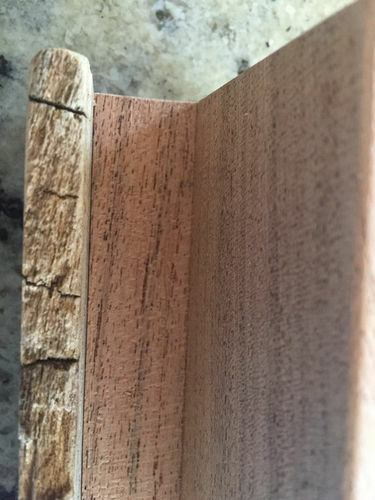 One frustrating thing for me has been that its neutral color, a real benefit in woodworking, makes it difficult to know when you have it all removed. You can’t really see it, and without UV, you’re stuck feeling for it. With the inexpensive and powerful UV flashlights available today, it’s easy to leverage UV for hide glue cleanup. For example, below is a white light photo of a hide glue joint that I scrubbed under warm water and thought I had clean. The next photo is that same area under UV light. You can see the obvious glow of left over glue. Under regular light, you can see that it’s a bit glossier there, but it would be easy to miss during inspection. I’ve discovered some other useful things UV can help you with in the shop that I’ll write about in the future. I made this into a blog series so that as I do find new things, I can add them. Nice. Now I have another use for that uv flashlight aside from refrigerant leak detection. Really. That can be useful. Yes, that’s a good trick. I use it too. 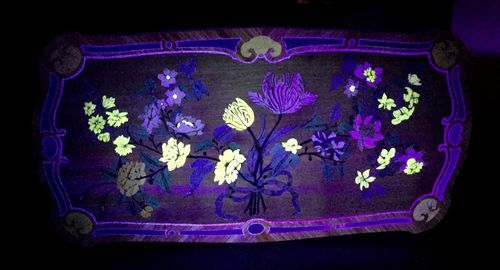 You can also use the uv light to help identify species of wood. John (Druid) posted a list a while ago of uv active species. I know for sure that the Berberis / Mahonia genus that includes Barberry and Agarita are among them.